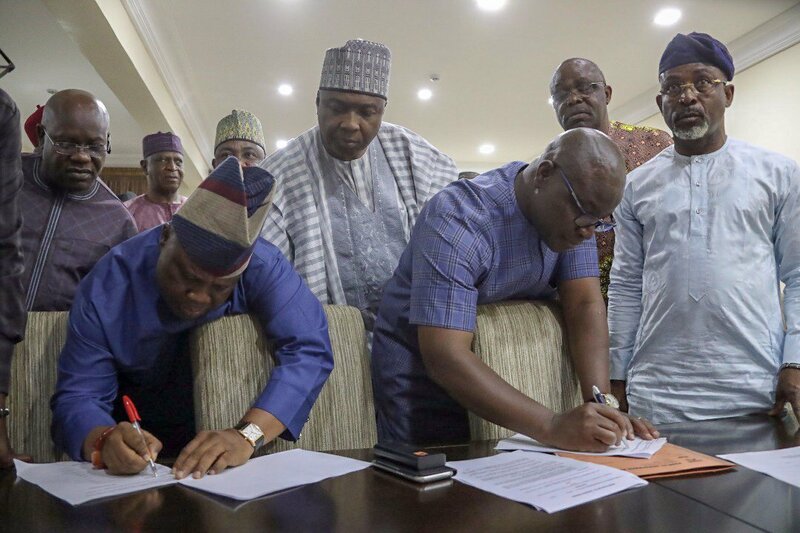 The People’s Democratic Party (PDP) yesterday disclosed that six governors and 27 federal lawmakers elected on the platform of the All Progressives Congress (APC) are set to join its ranks, soon. In a statement by its National Publicity Secretary, Kola Ologbondiyan, released in Abuja, yesterday, the party said it has already concluded discussions with the APC governors and lawmakers ahead of their defection. Expected in the PDP fold are two governors from the the North Central as well as another two from the North East. Daily Sun gathered that the party is also looking towards the South West and has already initiated talks “with a governor from the region…If all the factors are right, we will have an inroad into the South West,” said a PDP source who declined to named, yesterday night. Governors Aminu Tambuwal, Samuel Ortom and Abdulfatah Ahmed of Sokoto, Benue and Kwara states recently dumped the ruling party for the PDP. Also, Senate President, Bukola Saraki, alongside 14 senators and and 33 members of the House of Representatives defected from the APC to the opposition party. Specifically, the opposition party said the federal lawmakers will dump the APC after the resumption of the National Assembly later this month. According to the PDP, “discussions on control of party structures in the affected states and senatorial zones have also reached advanced stage and would be completed in a couple of weeks after which the governors and lawmakers will announce their defection to the PDP. The party added that it is ready “to take back control of power at the centre, as well as in our traditional states of Plateau, Niger, Adamawa, Kano, Bauchi, Nasarawa, Kebbi, Kaduna, Katsina, Kogi, Jigawa, Zamfara, Imo, Edo, as well as South West states of Oyo, Ogun, Osun, Ondo, Lagos states. Meanwhile, in bid to accommodate aggrieved APC members who might dump the ruling party, the party has extended sale of nomination forms for the presidential, gubernatorial and National Assembly primaries, earlier scheduled to end today. The new deadline for the sale of nomination forms is now Monday, September 10 while the deadline for submission is now September 11. PDP, APC etc. are clubs of bandits, generation of failures, political prostitutes, complicit and collaborators of the enemy which must go down in the hands of the enemy or with the enemy on the sunken ship nickname Nigeria in this final conquest of the Liberation Revolutionary Warfare of the natives under the natives Disintegrated Republics which is the conquest of Sokoto which has begun. God given Victory is the natives. Only the Sword decides. God Is With Us!! !